Your dentists may have suggested sealing your child’s teeth and you may have wondered what that meant. 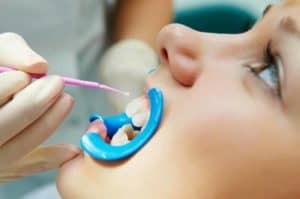 Although dental sealants have been around since the 1960s, their existence is not that well-known. Less than one-third of American children have had their teeth sealed. Today, your Reno dentists, Dr. William Wager and Dr. Brian Evans discuss dental sealants. Dental sealants are a liquid plastic resin material that is painted on the chewing surfaces of teeth to prevent cavities from forming. They are easy to apply and painless. Because it goes on as a liquid, the resin levels off into the grooves and depressions of the tooth, and hardens into a protective shield. The plastic barrier protects the tooth enamel from harmful bacterial plaque and acids. The main reason to get dental sealants is to avoid tooth decay. Your teeth develop pits and fissures while you are still children and that is why children and teens are the most likely candidates for sealants. Having your children’s teeth sealed helps keep their teeth safe from decay and healthy for years to come. Sealants are strong enough to withstand chewing and can last for years. Sealants aren’t reserved only for children, adults can benefit from them as well. Everyone needs to maintain their oral health and your teeth are meant to last a lifetime.